Most people will say that ceramic and porcelain is not porous and therefore cannot be sealed. It is true, traditional penetrating sealers will not work on ceramic or porcelain tile. The fact of the matter is that HydroShield South Louisiana offers a revolutionary protective coating for tile that is anything but traditional. As ceramic and porcelain tile are being produced, they are put through a kiln which heats the tile and provides the surface with a glazed shiny look. This glazed finish makes your tile appear shiny and is very much like a thin glass coating on the surface. Without proper protection this shiny glaze can begin to degrade over time. This is caused by the need to use acidic and abrasive cleaners in attempt to clean or maintain the surface. The shiny finish is worn away leaving the tile with a dull and aged look. The damage is irreparable. HydroShield South Louisiana has the solution! With a single application of HydroShield Tile Protection you can protect the shiny glazed finish of your tile and eliminate the need to use acidic and abrasive cleaners. We can keep your tile looking new for years to come. HydroShield Tile Protection provides a highly durable, slick finish to your ceramic. 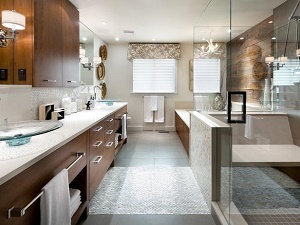 The result is tile that stays cleaner longer. 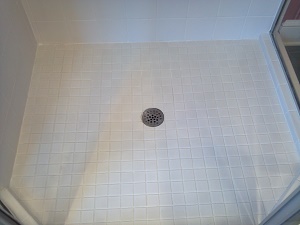 HydroShield Tile Protection makes your tile easy to clean, reducing maintenance by 75%. Clean up can be as simple as a quick once-over with water and a towel. Really, it’s that easy! Not only will you see a drastic reduction in the amount of time it takes to clean your home, once HydroShield is applied, you can throw away those harsh chemical cleaners. This creates a more eco-friendly environment as well as a kid-safe zone by eliminating all of those products you must keep from their reach. HydroShield Tile Protection prevents damage before it has a chance to occur. Because our coating fills in the microscopic pores of the tile and creates an irreversible bond, the tile will continue looking new for years to come. Relax, we have you covered! HydroShield Tile Protection comes with a 5-year warranty. We are a locally owned and operated business. We stand behind every application that we do. If you have a question or concern, you call a local number and speak to a real person, not a toll-free number where you sit on hold and hope for a solution. We have technicians that come to you and provide superior customer service. I had HydroShield applied to my shower doors over 9 years ago and it is still performing!